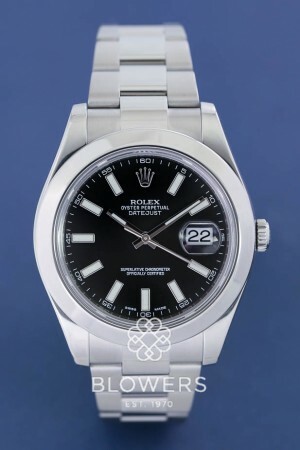 Rolex Oyster Perpetual Datejust 4I 116300. Automatic chronometer movement. 48 hour power reserve. 41mm steel case which is water resistant to 100 meters. Black dial with Index hour markers. Smooth polished bezel. Steel Oyster bracelet with comfort adjust. Box and papers dated December 2013. SKU: 3010425. Categories: Datejust & Date, Gents, Rolex.